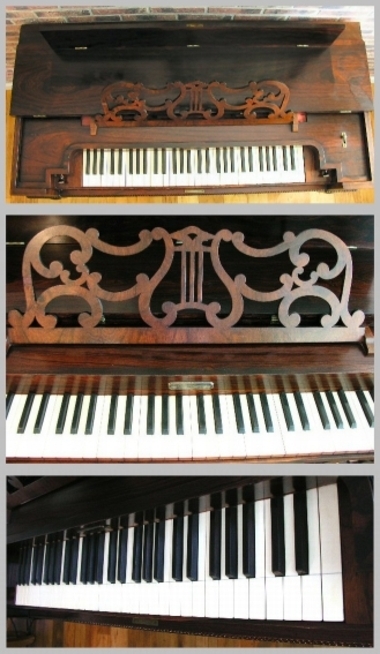 If you was expecting to see a button accordion in this article then you might like to know that a melodeon is also a 19th Century reed organ with foot operated vacuum bellows. 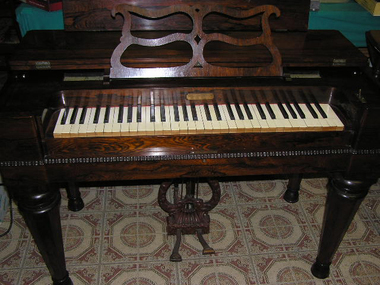 It differs from the related harmonium which uses pressure bellows. Today I am featured two such instruments made by Geo. A. 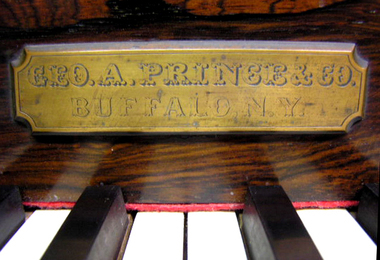 Prince & Co. of Buffalo, NY. 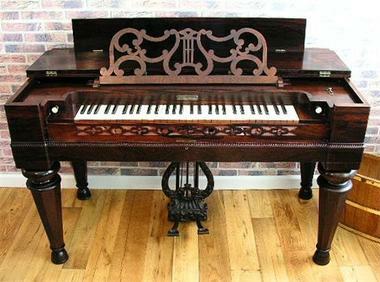 The first one is dated 1858 and has a buy it price of just $345 (£183). Too bad that it is for local pickup only, and in Los Angeles otherwise I would be sorely tempted. 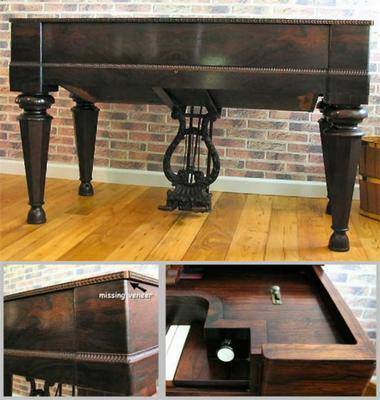 I find it heartening to find 148 year old instruments like this are still available for reasonable prices. This second one is slightly earlier in date and is even more impressive. 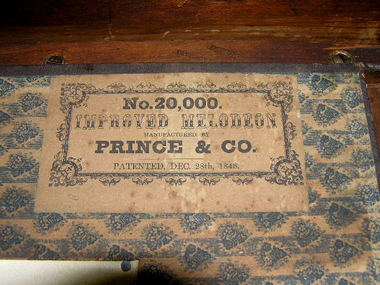 I am seeking information about a George Prince melodeon given to my grandmother in Michigan in the early 20th century. It belongs to my mother now but she is over 90, has to move, and we are going to have to dispose of much of the contents of her house. The number "101" is stamped in a wooden element of the frame near the bellows. The instrument looks a lot like No. 2000 in the post to which I am responding. "Geo. T. Prince & Co. The first two lines of the plate are engraved in a copperplate-style script; the last line is in roman italics, with "Buffalo" in all capital letters. The plate is somewhat tarnished, but it did look to me like it said "Geo. *T." Prince," not George *A. * prince, but I could be mistaken. Was George T. perhaps the founder of the business and succeeded by a son, George A., or vice-versa? Does the address pin down the date of manufacture? The instrument is missing the pedals that operate the bellows. The keys work--at least the spring back if pressed--but I have not tried to access the reeds or stop mechanisms to assess their condition. My mother understands that the case is made of rosewood. 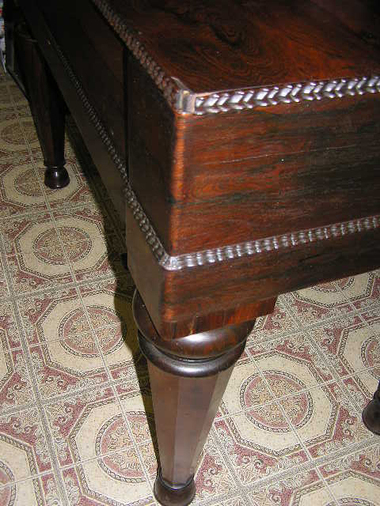 It would require refinishing. The hinges at the back of the lid have come loose from the case, but are present. 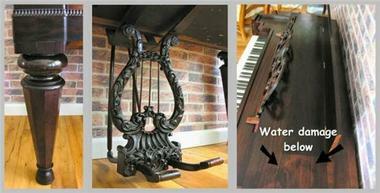 Would it be worthwhile to seek a restorer for this instrument, or should we take it to the trash dump? Could you possible send me a detailed photo of the under straps and lyre, specifically how it is attached to the case? I'm trying to replicate one that disappeared from a smaller Prince melodian. Unfortunately I have no photos of those parts. These are just photos I took from Ebay. Good luck with your restoration project though, I enjoyed looking at your site. I am looking to buy a Prince melodian/melodeon. If you have one for sale or know of any that might be for sale, please contact me at Screenery[AT]gmail[DOT]com. I have a George Prince Melodeon for sale..for sale in perfect working condition.. Look exactly like the one on the home page or in the george Prince adv..with the bolder legs..will send pictures and all info if contacted. for sale and it is in good condition. It has been in my family forever, my great great grandparents bought it brand new. If anyone is interested please contact me @ 949.633.0401. 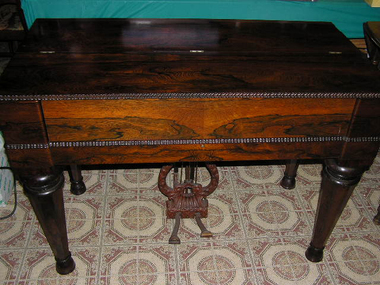 An Ontario Van Loon family heirloom going back to the 1850s. 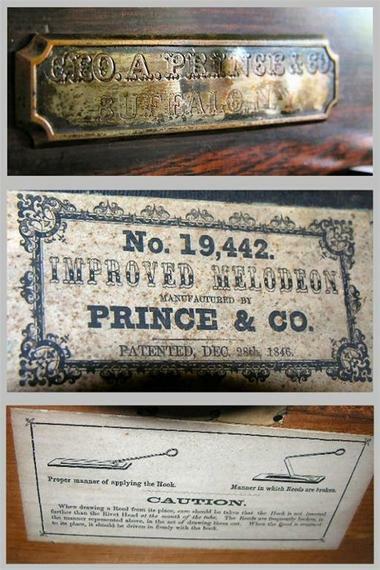 Question: what would be the approximate manufactured date of Improve Melodeon #18,571, made by Prince & Co. Pat. Dec. 28, 1846 ?